The fedora is the one item most recognized as Indiana Jones. Throughout the three movies, the fedora went through some changes. In each Indiana Jones movie, the fedora was shaped noticeably different. In Raiders of the Lost Ark, the fedora was the tallest with a straight sided crown and tight pinch at the front. 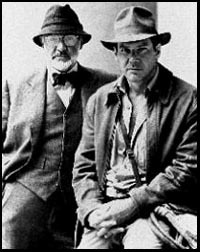 In Temple of Doom, Indy's hat was shorter with a more tapered crown. In Last Crusade, the pinch was not as tight and neat as in Raiders. The fedoras used in Raiders of the Lost Ark were all reportedly supplied by Herbert Johnson based on a Brazilian line of hats. The brim was wide, with a tall untapered crown, very little rounding at the top, and a tight high pinch and center dent. With the release of Temple of Doom in 1984, Stetson reportedly secured product placement in both the actual movie as well as in the marketing. Last Crusade saw the return of a fairly distinctive hat profile. While not as dramatic as the Raiders hat, this hat sported a tall untapered crown, but a less tightly pronounced pinch. In addition, the brim appeared to be slightly narrower with more of a prominent upward curl, and more of a snap-brim. Stetson had allowed their license on the hat expire; and Dorfman-Pacific now holds the license agreement with Lucas Films Indiana Jones(TM) for the official Indiana Jones hat. Dorfman-Pacific is a large supplier of men's, women's and children's headwear. They've been in business over 80 years and their home office is in Stockton, Ca.